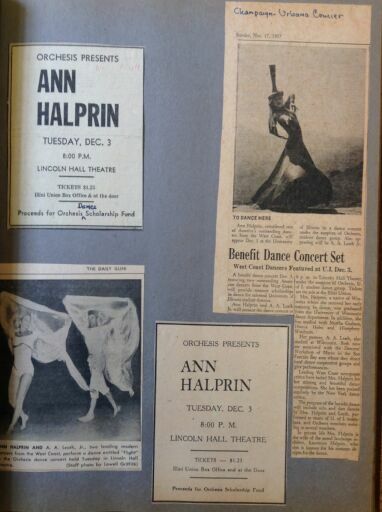 Digital Surrogates from the Margaret Erlanger Papers include digitized correspondence, photographs, curriculum proposals, dance concert posters and programs, and newspapers clippings, concerning Profesor Erlanger's contribution to the creation of the Dance Department at Illinois, and to the evolution of the undergraduate and graduate dance programs. The Margaret Erlanger Papers (Digital Surrogates) are managed by the University of Illinois Archives and do not feature precise descriptive information for each item. Discover their contents by browsing the folders and files. For more information, contact an archivist at illiarch@illinois.edu.